Our first seminar speaker of the term is Robert Bickers, professor of history at Bristol and director of the British Inter-University China Centre. Prof Bickers is also one of the people behind the Historical Photographs of China website, and he has a blog of his own, too. The title of his seminar is World in motion: professional circuits through 19th-century China. All details are in the poster below. Please join us! Several of the posters for forthcoming seminars will feature equally camp images. This is pure coincidence (images were sent to me individually by each speaker, not selected by me for the lulz), but it may suggest what I have long suspected: people were just camper in the past. Even old ladies, as you will see in week 5. 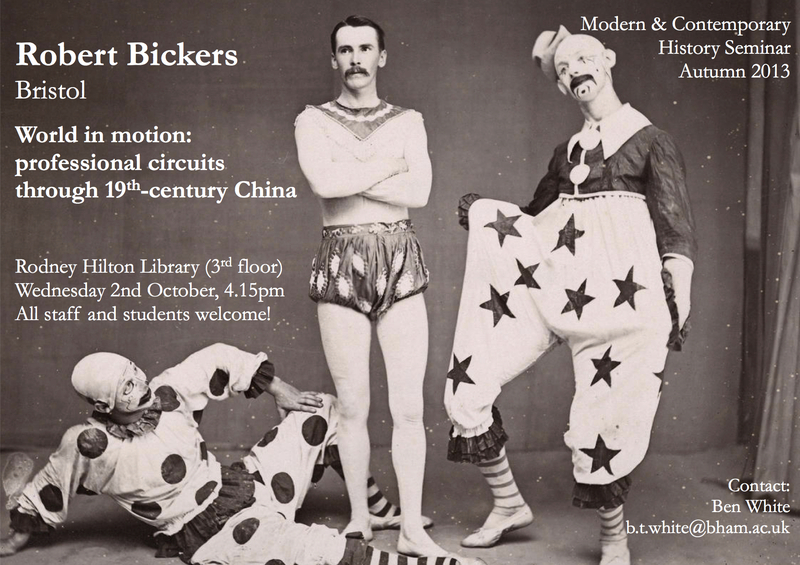 Every Wednesday at 4.15 in the Rodney Hilton library (Arts building, 3rd floor) we have our research seminar, starting in week 1 with Robert Bickers, professor of history at Bristol and director of the British Inter-University China Centre. Prof Bickers is also one of the people behind the Historical Photographs of China website, and he has a blog of his own, too. The title of his seminar is World in motion: professional circuits through 19th-century China. On the afternoon of Friday 6 Dec we will be running our autumn term round table on ‘Histories of the supernatural’. Confirmed speakers so far are Rhodri Hayward (Queen Mary), Isak Niehaus (Brunel), and our own David Gange. We also have a provisional date for our annual lecture, and we’re very pleased to announce that the speaker this year will be Susan Pedersen, professor of history at Columbia University. The lecture will take place on Wed 12 Feb (a bit earlier in the year than usual), and there’ll be a postgraduate event beforehand. Details of events will be posted here ahead of time, so click on the little tab marked ‘+ Follow’ in the bottom right-hand corner to receive updates by email (if you haven’t already). 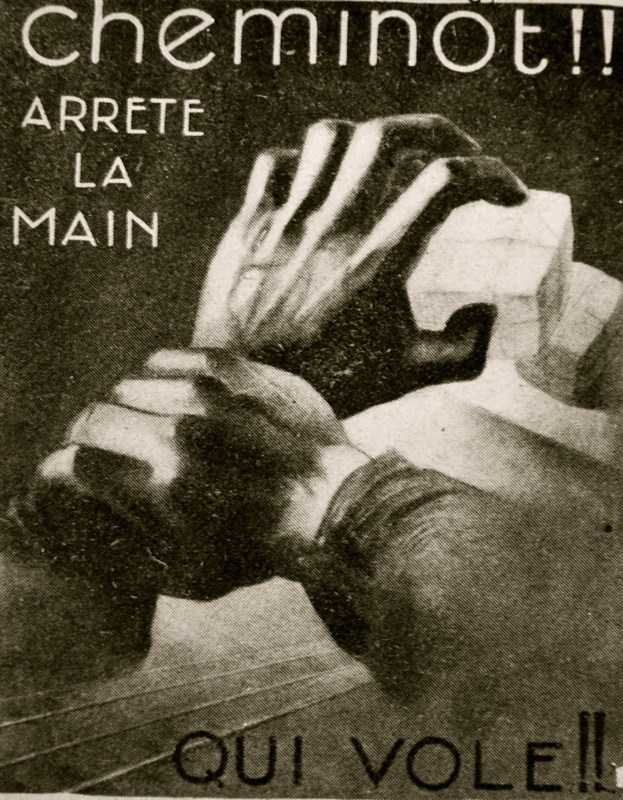 We’re also getting some excellent images from our seminar speakers for the posters—here’s one from Ludivine Broch, who’ll be speaking on Wed 20 Nov about theft on the railways in wartime France. The project to mark next year’s 50th anniversary of the Birmingham Centre for Contemporary Cultural Studies is gathering pace. The other week I went down to London to interview Stuart Hall, who was of course a founding member of the Centre and its director for more than ten years. Stuart reflected on his time at the Centre, the politics of the original cultural studies project and where he thinks cultural studies is at today. We filmed the interview, but you’ll have to wait to see it in full – we’re going to show it at the conference we’re organising to mark the 50th anniversary of the Centre this June (more information about which can be found here). If you can’t wait until then, though, you can listen to the other interviews I’ve conducted with key players here, as well as download PDFs of the Centre’s Stencilled Occasional Papers here. Tickets for the conference will go on sale very soon! This conference, organised by the British Commission for Military History in association with the School of History, University of Kent, intends to highlight current research being undertaken by postgraduate and early career scholars in the field of military history and related disciplines. This is the British Commission for Military History’s fourth annual New Research conference giving postgraduate and early career scholars an excellent opportunity to meet, share new ideas and discuss the latest research. Papers on any aspect or period of military history are welcome. Proposals (c. 300 words) for papers of 20 minutes should be submitted, along with an academic CV, to the organisers at bcmhnewresearchers@gmail.com by Friday 27 September 2013. The British Commission for Military History is the pre-eminent association for professional military historians in the UK, dedicated to the promotion and discussion of military history in its broadest sense. Participants at New Research in Military History will also be welcome to attend the Commission’s autumn conference ‘Engineers in Command’ on Saturday 23 November 2013 at the Royal Engineers Museum, Gillingham. Details of the conference have been posted on the IHR’s events pages, where you can also download the call for papers.